Your body has two types of blood vessels arteries carry oxygen- and nutrient-rich red blood from your heart to your muscles and organs, while veins return the “used” bluish blood back to your heart. The deep veins located beneath the muscles carry about 90 percent of the blood Travelling from your legs back to your chest. The other 10 percent flows through veins located closer to the surface, often visible, and less well supported. While your leg muscles help your veins pump the blood upward, the real workhorse is an intricate system of one-way valves that prevent the blood from draining back down the leg under the force of gravity. In many people, women in particular, these valves stop working as well as they should, putting additional pressure on the wall of the vein. Varicose veins results from a chronic dilatation of the veins, a condition called “varicosity.” When the vein walls are pushed apart, the valves no longer seal properly, making it difficult for the muscles to push the blood upward. Instead of flowing from one valve to the next, the blood begins to pool in the vein, increasing venous pressure and causing the vein to bulge and twist. The result is varicose veins. In some people, varicose veins are simply a cosmetic concern. In others, the condition leads to pain and more serious problems. And in some cases, varicose veins can signal a higher risk for other conditions involving the circulatory system. When inflamed or clotted, they become hard and tender to the touch. Increasing pressure may cause itchy skin and aching in the affected limb. spontaneous bleeding, which occurs as the skin over the varicose veins becomes thin. The vein may be easily injured, even by bedding, clothing or a slight bump, and blood loss can be significant, without any noticeable pain. superficial phlebitis (ST), also called superficial phlebitis, which is an inflammation of a vein just below the surface of the skin. The inflammation may be caused by decreased blood flow through the vein, damage to the vein or blood clotting (known as thromboses). Symptoms include redness and a firm, tender, warm vein. Localized pain and swelling also may occur. ST also increases a patient’s risk for deep vein thrombosis (DVT), a potentially serious condition that involves a blood clot in a deep vein. They are four times more likely than men to develop varicose veins. Up to 50 percent of American women may be affected at some point in their lives, according to the American College of Phlebology. People whose family members have varicose veins. Heredity plays a major role. Varicose veins affect one out of two people over age 50, and they are more common in women than in men. Also as women age, varicose veins become more visibly pronounced. In addition to hormonal changes, pregnancy causes both an increased volume of blood and increased pressure from the abdomen, which in turn causes veins to enlarge. The good news is varicose veins due to pregnancy often improve within three months after delivery. However, with successive pregnancies, these abnormal veins are more likely to enlarge further. Many cases of varicose veins are clearly visible, with the knotted, twisted or bulging darkened veins showing beneath the skin of the thigh and lower legs. And, your legs may be swollen. If you have varicose veins, you may also experience pain in the legs, especially after standing or sitting still for a long time. Some women describe the pain as feelings of fatigue, heaviness, aching, burning, throbbing, cramping or restlessness. Severe varicose veins can make your skin itchy or lead to a skin condition similar to eczema or even ulcers on your lower legs. Keep in mind that not all leg discomfort is caused by varicose veins. Any persistent or severe symptoms warrant a visit to your health care professional. Vein disorders are not always visible. If you can’t see any symptoms, or, to help determine the cause and severity of the problem, your health care professional may conduct a noninvasive ultrasound or other vascular test. Be sure to call your health care professional if swelling becomes incapacitating or if the skin over your varicose veins becomes flaky, ulcerated, discolored or prone to bleeding. In addition, if you have redness, warmth and burning pain in the area of a vein, call your health care professional, because this can be a sign of phlebitis or a blood clot. Walk regularly, which helps improve muscle tone and circulation. Find several times during the day when you can elevate your legs for 10 to 15 minutes. Wear compression hose or stockings, which can be purchased at most pharmacies. They help your leg muscles push blood upward by concentrating pressure near the ankles. Specially manufactured gradient-compression support stockings are the most effective for controlling symptoms. They may also prevent worsening of the condition and avoid the need for future treatment. Take an over-the-counter anti-inflammatory drug such as aspirin or ibuprofen to alleviate occasional swelling and pain. red bumps at the sites of the injections, which fade within a few days. In addition, if you develop small painful ulcers at the injection site, inform your health care professional immediately. Although sclerotherapy works well for spider veins, studies show that it is not as effective as surgery for treating varicose veins and that recurrence rates are high. Endovenous chemical ablation, also known as ultrasound-guided sclerotherapy, involves the injection of a chemical irritant—called a sclerosant—into a vein while the doctor watches the process on an ultrasound screen. This process enables treatment of veins that can’t be seen because they are further beneath the skin. External laser/light source treatments are generally used only to treat spider veins or very small varicose veins and may be combined with sclerotherapy. A laser or light beam is pulsed onto the veins to seal them and cause them to dissolve. Multiple treatments are usually required. Endovenous radiofrequency ablation involves using radiofrequency to shrink and seal the deeper varicose veins of the legs. This method has replaced surgery for a majority of patients. Usually done in a health care professional’s office under local anesthesia, a small catheter is inserted into the damaged vein and delivers radiofrequency energy to the vein wall, causing it to heat. As it warms, it collapses and seals. endoscopic vein surgery, which is usually reserved for advanced cases involving leg ulcers. The surgeon inserts a thin video camera into the patient’s leg to visualize and close varicose veins and then removes the veins through small incisions. Unfortunately, no treatment can prevent veins from becoming varicose. Varicose veins sometimes recur after any form of treatment, but it’s not the same vein coming back; it’s a different vein becoming affected. Before undergoing any procedure for varicose or spider veins, be sure to tell your health care professional if you’ve ever had blood clots in your lungs or legs. phlebologists, who specialize in the field of medicine that deals with vein diseases. In 2005, the American Medical Association officially recognized phlebology as a self-designated specialty for physicians. Unfortunately, some treatment centers specializing in varicose veins have been caught by the Federal Trade Commission making unfair promises to patients. Keep in mind that no treatment for varicose veins is ever 100 percent effective, and there is never a 100 percent guarantee that other veins in your legs won’t become varicose. Some companies distribute herbs or over-the-counter diet supplements with claims they prevent or cure varicose veins. While some of these supplements claim to have been shown in testing to improve circulation or impact veins in other ways, keep in mind that herbs and supplements are not regulated, and there is no guarantee of quality, safety or efficacy. Also remember that there is no 100 percent cure for or prevention of varicose veins. And keep in mind that it’s important to discuss cost of treatments and out-of-pocket expenses because your health insurance may not cover the cost of the procedure. Avoid standing or sitting for long periods in the same position. Take breaks from an office job to get up and move around, or when you’re driving for long periods, get out and stretch your legs. If you work in a “standing” profession like teaching or retail sales, stretch and exercise your legs as often as possible to increase circulation and reduce pressure buildup. When possible, wear support stockings as noted below. Try to elevate your legs when resting. Walk for exercise, and do it regularly. Staying fit keeps your leg muscles toned, your blood flowing and your weight under control. Include high-fiber foods in your diet since constipation can contribute to varicose veins. High-fiber foods include fresh fruits, vegetables and whole grains. Wear graduated compression support hose. Use regular sun protection (some unwanted spider veins on the face may be related to sun exposure). About 90 percent of the “used” blood traveling from your legs back to your chest is carried by the deep veins located within the muscles. Vein abnormalities here aren’t visible but can be painful or even result in dangerous blood clots. The other 10 percent of the blood returning to your heart travels through veins closer to the surface; varicose veins here can be visibly swollen, knotted, twisted or bulging. According to the American College of Phlebology, up to 50 percent of American women have varicose veins or a related venous disorder. Varicose veins are more likely to occur in older women. Also as women age, varicose veins become more visibly pronounced. Spider veins, also referred to as telangiectasia or broken capillaries, are formed by the dilation of a small group of blood vessels located close to the surface of the skin and are most commonly found on the legs and face. They look like red or purple sunbursts or branched or web patterns. Pregnant women often develop varicose veins for a number of reasons: In addition to hormonal changes, pregnancy causes both an increased volume of blood and increased pressure from the abdomen, which in turn cause veins to enlarge. The good news is varicose veins due to pregnancy often improve within three months after delivery. However, with successive pregnancies, these abnormal veins are more likely to remain. Varicose veins aren’t just a cosmetic concern. They can pose a health risk and are associated with the development of skin ulcers; phlebitis, which is an inflammation of the vein; or blood clots. Though it may require several sessions and the veins may fade only gradually, sclerotherapy, a procedure performed in a health care professional’s office, can result in significant improvement in the appearance of spider veins. Studies show that it is not as effective as surgery for treating varicose veins, however, and that recurrence rates are high. While there are several treatment options for small varicose veins and spider veins, large varicose veins may require radiofrequency closure and/or surgery. No treatment for varicose veins is ever 100 percent effective, and there is never a 100 percent guarantee that other veins in your legs won’t become varicose. Both your leg muscles and valves within your veins work to get the used blood from your legs back up to your heart. When the valves stop working as well as they should-which can be caused by heredity, abdominal pressure, increased pressure from prolonged standing, obesity, hormonal changes, aging and a number of other factors-the blood pools in the vein, stagnating there and causing the vein to bulge or twist. Are varicose veins dangerous, or just more of a cosmetic issue? Although they can be painful and unsightly, in most cases, superficial or visible varicose veins don’t lead to further complications. If you are concerned, your health care professional can conduct some painless tests to determine the severity of the problem and ascertain if any of the deeper veins are affected. My varicose veins are visible, but not very bothersome. Do I need to have them removed? Probably not. If only surface veins are affected, the condition is usually harmless. You would probably be feeling more pain or other symptoms if deeper veins were abnormal, which can lead to more serious problems. However, you may want to talk to your health care professional about these concerns. My legs always seem to be tired and achy. Do I have varicose veins? Leg pain can be caused by a number of factors or conditions. 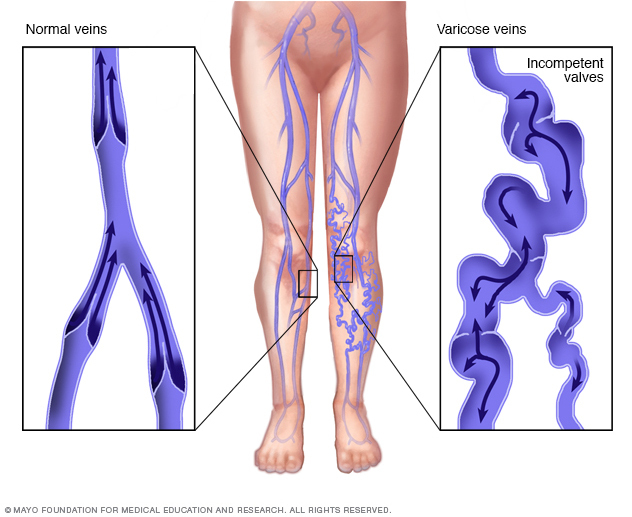 If the pain seems to be brought on by standing or sitting for prolonged periods, you could have varicose veins. But if you have no visible symptoms, the only way to determine the cause of your pain is to have some tests done by your health care professional. I’m pregnant and have developed varicose veins. Will they go away? Varicose veins due to pregnancy often improve within three months after delivery. However, with successive pregnancies, these abnormal veins are more likely to remain. My general practitioner doesn’t think my superficial varicose veins are problematic, but I’d like to have them removed for cosmetic reasons. Who should I see? The best idea is probably to get a referral from your health care professional or from a friend or family member who has been successfully treated. The types of health care professionals best suited to treating varicose veins are most likely vascular or general surgeons, dermatologists and phlebologists. Will my varicose veins come back if I have them removed? Once the vein is removed, it’s gone forever. However, you very well could develop varicosity in other veins. I saw an advertisement for a “vein clinic” that made all sorts of promises about permanently making my varicose veins disappear with no risk or pain. What’s that all about? Keep in mind that no medical treatment is ever 100 percent risk-free and cannot be 100 percent guaranteed. While it’s true that once a varicose vein is removed surgically, it will not reappear, that doesn’t mean you will forever be free of varicose veins. Other veins can develop problems. Remember that surgery is a rather drastic measure. The less drastic corrective measures such as sclerotherapy or laser treatments are by no means 100 percent effective 100 percent of the time. And none of the corrective measures can be guaranteed to be totally pain-free.